The main problem of having big and costly phones like the iPhone are that the thieves are always eying your possession and are eager to get their hands on it. So you have to be a bit more careful than before while handling your precious possession, not only do you have to be physically more alert but have to be intelligent too and Secure your iPhone by using just these 2 simple steps. By applying these two simple tricks you can secure your iPhone and also be sure that no one from your friends or foes are meddling with your personal info, and you can have a check on avoiding people from looking at your personal information. This is a simple procedure which requires just 2 mins of your precious time to secure your personal information from unwanted access. You can then view that Simple Pass code is ON, but you have to turn it off. There will be limited 10 attempts for a passcode, if you are wrong for more than 10 times then you will have to take it to the store to restore it. Never use the most common and predictable passwords for ex: 1234 or 0000 or abcd or asdf, which can be predictable. Insted you should be using complicated passwords by including Words Alphabets and Symbols together which can be impossible to guess and predict even by your friends. When these simple tips are followed and used in creating your password this can secure you personal information. Most of the iPhone users don’t know what SIM pin is which can be very useful in saving you sim from being used illegally. You might have Passcode locked your phone but that can never protect your SIM from being used without your knowledge, you can just remove the sim from your phone and make all sorts of Texts, Downloads and calls which will be charged in your bill and at the end of the month will be a shocker to see the massive bill if you have not bothered to block your sim as soon as you lost your phone. 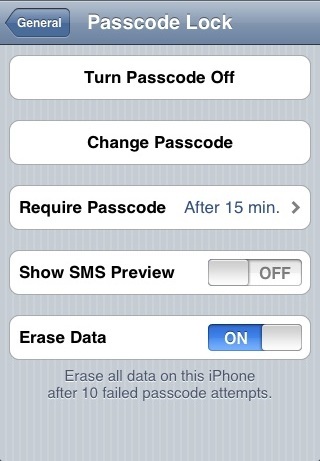 Make sure that your Sim dosent have any earlier Passcode. So by following these 2 simple steps you can Secure your phone and SIM card and feel safe about your personal information which cannot be stolen or viewed in your absence or without your knowledge. In the Passcode for your phone, there will be 10 attempts only after which your phone will be locked permanently which can only be unlocked by the Store people, and all the data on your iPhone will be erased after these unsucessfull attempts. Coming to the Passcode for Sim, if a passcode is asked before you have even set one it will always be “0000” which is the factory setting for all the sims.